History maker, Sunday Adetunji, is first Abia Warriors player to score 14 goals a season in Nigeria's topflight. 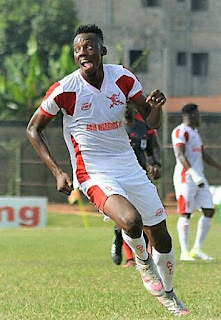 Injured Sunday Adetunji has erased the 13-goal a season top flight record of former Abia Warriors golden boy, Chisom Chikatara, after scoring a brace during the 4-2 annihilation of Lobi Stars, in last Sunday’s road trip to take his season’s tally to 14 goals. Sunday’s feat puts Adetunji in the club’s folktale as the first player to score 14 goals a season in the topflight to replace the 2015 record of Chikatara. However, Chikatara remains the club’s all-time scorer. Adetunji, who switched to Abia Warriors this term, was on 12 goals before the match day 33 clash where he fired a brace to lead the away win. It was a brilliant day for the consistent scoring Adetunji who freely rang rings round the Lobi Stars defence on match day. “I never expected the record to stay long. It shows the team is growing and that’s my prayer for the team. I pray the team continues to grow,” Chikatara, now based in Morroco with Wydad Casablanca told naijaleague.com.ng, while applauding the performance of Adetunji. Ironically, he suffered an injury after scoring his brace and won't have a chance to boost his club and league record this term. Adetunji’s Abia Warriors' career started on a bright note as he claimed the Influential League Bloggers Award Player of the Month gong in February and his clinical finishing in front of goal earned him a place in the CHAN Eagles camp. 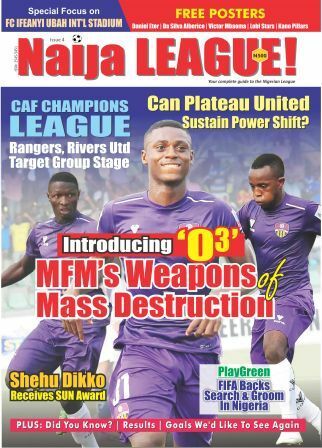 Abia Warriors made its topflight debut in 2014.